The Hazardous Materials Program is part of the Hazardous Materials Compliance Division (HMCD) within Santa Clara County Department of Environmental Health. HMCD is the Certified Unified Program Agency (CUPA) for all areas of Santa Clara County other than the cities of Santa Clara, Gilroy, and Sunnyvale. HMCD provides comprehensive environmental regulatory compliance inspection services to protect human health and the environment. Additionally, program personnel perform plan reviews and inspections associated with the construction, upgrading, and closure of hazardous materials storage facilities and equipment. HMCD's Site Mitigation Program also administers the Leaking Underground Storage Tank Local Oversight Program (LOP) throughout Santa Clara County. This program, which oversees the cleanup of sites contaminated by petroleum from UST releases, was formerly administered by the Santa Clara Valley Water District. 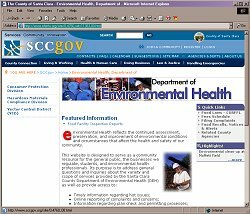 Visit the Santa Clara County Department of Environmental Health website or contact us directly.